CAMDEN – OCT. 22, 2018 – The Delaware Blue Coats, the NBA G League Affiliate of the Philadelphia 76ers, announced today the team’s 2018 training camp roster and practice schedule. Training camp begins today, Monday, Oct. 22 at the Philadelphia 76ers Training Complex in Camden. 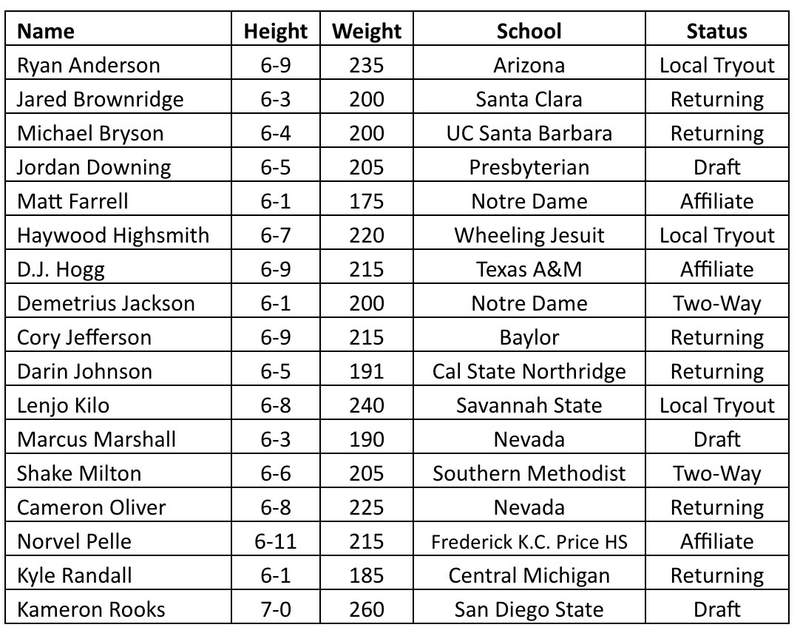 The Blue Coats’ training camp roster includes two players signed to two-way contracts with the 76ers (Demetrius Jackson and Shake Milton), in addition to affiliate players Matt Farrell, D.J. Hogg and Norvel Pelle who participated in 76ers training camp. The team’s current roster also includes six returning players, three NBA G League Draft selections and three players added via the team’s local open tryout. In Saturday’s 2018 NBA G League Draft, the Blue Coats selected Marcus Marshall (No. 23, First Round), Jordan Downing (No. 3, Third Round) and Kameron Rooks (No. 9, Fourth Round). The team also completed a trade to acquire Michael Bryson from the Iowa Wolves in exchange for the returning player rights to James Webb III and Hakim Warrick, whom Delaware selected with the No. 9 overall pick in this year’s draft. Additionally, the Blue Coats have announced their 2018 training camp practice schedule. All practices will be held at the Philadelphia 76ers Training Complex (3 Banner Way, Camden, NJ 08103). Media availability will occur after the last practice session of each day. Media interested in attending practice sessions at the Philadelphia 76ers Training Complex must contact Blue Coats PR.